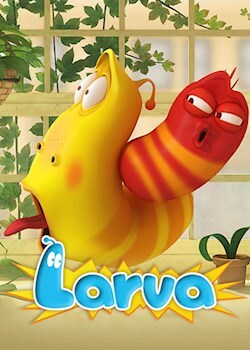 Larva find a house; Yellow can blow bubbles; Red is a robot head; Brown has tracked down Larva; Trapped in the freezer; Yellow swallows a Toy. The pursuit of food; Caring for a tomato; Red & Yellow find some make-up; Red won't share; Dandelion pollen; A magical singing vase. Bitten by a spider; Temperamental; Red is rejected again; Yellow trains his tongue; Brown dances in his own style; DIY arms & legs. Violet's back; Yellow love handles; Revenge on Prism; Red & Yellow melt; Red's nightmare; The bathroom; Yellow swallows a chick; Yellow finds cookies. Red finally finds love; But love leads to heartbreak; It's all fun in the snow; Brown-oki; This is how the bromance started; Loss of his sausage. Red suffers from amnesia; Eating beans; Yellow learns how to control Maroon; Why is Brown so afraid of water? ; Frog shows up; Essence of flowers. The gang tries some berries that don’t go down so well; Red & Yellow wake up to find a wrecking ball; Yellow helps Red to escape; Red takes control of a flying fish to escape the seagulls.